Starting 10th on the grid, Talbot was enjoying improved balance on the striking black Porsche that debuted yesterday. The car’s handling and speed gathered throughout the course of the race and of the front runners, Talbot was the one to make the most ground. With team-mate John Martin watching on, the 2016 Blancpain Endurance Series Champion systematically edged past a number of competitors to end the race in sixth placing. Following Martin’s fifth place yesterday, the result for Talbot this afternoon places the Hot Wheels™ Car Care Products duo in good stead from a Championship perspective at the halfway point of the weekend. 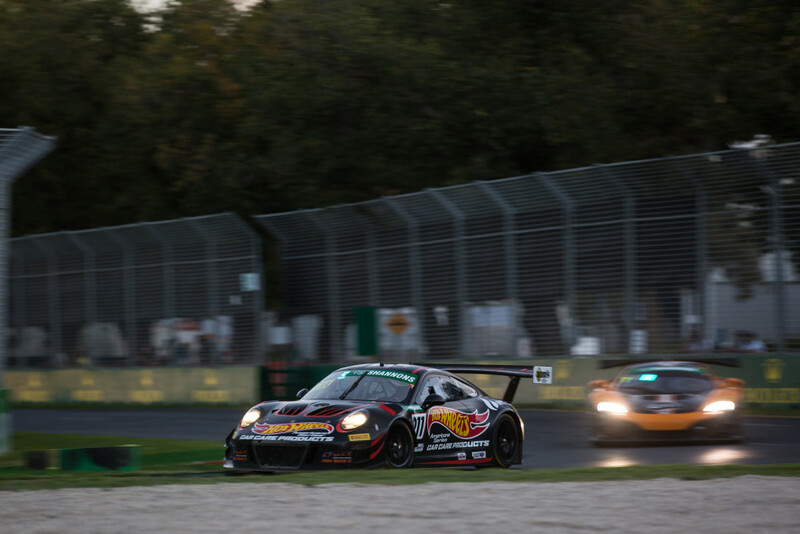 Talbot praised the work the Walkinshaw GT3 team did overnight to bring the car to a considerably more comfortable position than he experienced yesterday. Tomorrow, Martin will start race three from fifth placing at 12pm local – with television coverage expected on Network Ten. Then Talbot will complete the weekend on Sunday in front of the expected record Formula 1 Rolex Australian Grand Prix crowd. Today’s race was re-scheduled until 7pm after a track repair incident impacted the originally allotted start time. In addition to Hot Wheels™ Car Care Products, Liam Talbot Racing has drawn support in 2018 from MEGA Fuels, Hardy Brothers Jewellers, WashIt Australia Truck Wash and Urban Maintenance Systems. “I tried to take no risk of the start, we kind of got swamped. We got past a few guys and then started to motor away. “I really wish we had a few more laps to be honest! The Hot Wheels™ Car Care Products Porsche was epic and I can’t sing the praises of the Walkinshaw GT3 guys highly enough. They set it up so well and the track is coming to ius. “It is predicted to be wet tomorrow and this car loves the wet – as do the drivers! “We’ve got a new aero setup which created some instability in the balance of the car, but we learnt from that, made a change and it has gone in the right direction, so we’re really happy with the pace of the car.